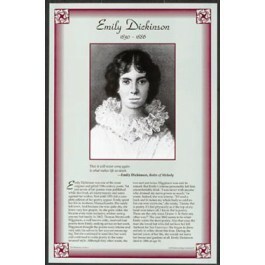 This unique educational poster features an artist's depiction of the great 19th century poet Emily Dickinson, as well as a quote from "Bolts of Melody," and concise biographical text of her life and career. 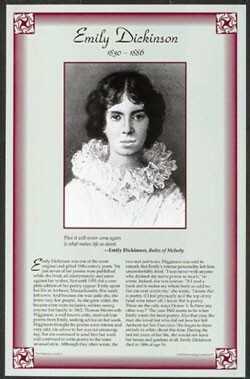 Emily Dickinson was one of the most original 19th century American poets. Yet just 7 of her poems were published during her life. Known as a recluse, she did not leave her house and gardens for the last 10 years of her life. This poster will introduce students to this fascinating and brilliant writer.